That’s the range of ticket prices I found on a quick check on Ticketmaster and StubHub: $277 each for nosebleeds behind the stage; $3,262.40 EACH for front row center. Have mercy, baby. Love me some Mac, but that’s too rich for me. How about you? Here’s a free YouTube video from their 1982 Mirage tour, instead. UPDATE: I went to the concert in Atlanta. It was awesome. Read this. This entry was posted in Atlanta, Entertainment, Social Media and tagged atlanta, concerts, Fleetwood Mac, Music, Philips Arena, StubHub, Ticketmaster on October 4, 2014 by Jay Croft. 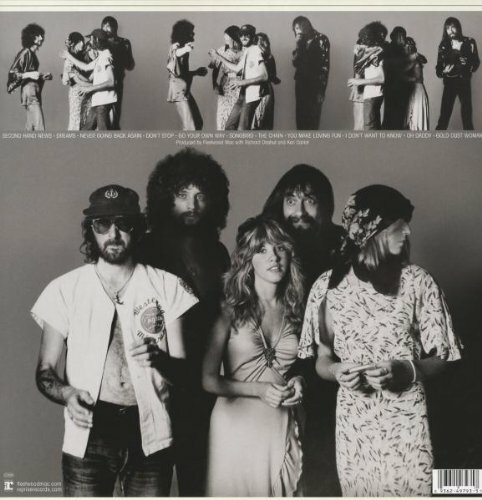 Back in the day, John McVie and Christine McVie were divorcing; Lindsey Buckingham and Stevie Nicks were breaking up; and Mick Fleetwood’s marriage was ending while they wrote and recorded “Rumours.” It’s still one of the biggest-selling albums ever. Fleetwood Mac was everywhere in the summer of 1977, including the back seat of my parents’ Oldsmobile. We were moving to another state, far away. I was 13. And near the beginning of the trip, I found “Rumours” on sale for $3.99 in Eugene, Ore. A friend convinced me to scoop up the bargain, the first album I ever bought. It was on vinyl, long before personal cassette players, and our car didn’t even have an eight-track player. So for the unfolding weeks of that sultry season, across the country and halfway back again, I guarded the album from heat, unable to play it but convinced I’d scored a deal because my friend — who was a little older, much more physically mature and impossibly more sophisticated than I was — had told me so. … and today. The tour, with Christine McVie back behind the keyboard, stops in Atlanta on Dec. 17 at Philips Arena. Plus, the music was inescapable and, for reasons I couldn’t begin to understand, I knew I loved it, even then. The churning rhythms. The gorgeous harmonies. The Southern California glamour. The already famous infighting among the band’s lovers — songs by three startlingly individualistic writers on an album that morphed to provide, as one critic put it, the audio equivalent of a soap opera told from three different characters’ points of view. The band had two couples, both breaking up while the album was made, and there’s blood and tears all over it. Back then, I knew nothing about love or its demise. But I already knew I liked a sharp turn of phrase and was drawn to larger-than-life characters, and this band had five. And, although I didn’t fully realize it until later in life, I wonder whether the epic cohesiveness of the record tapped into some innate understanding I had of alchemy, the magical process of creating something grander than any of its parts. Sure, Mick Fleetwood and John McVie are a top-flight rhythm section. 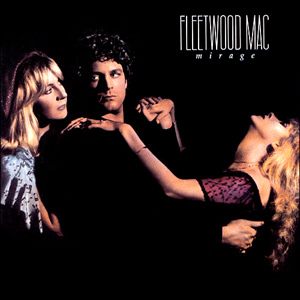 Of course Lindsey Buckingham is a fabulous guitarist, Stevie Nicks an enchanting beauty and Christine McVie a pristine vocalist and journeyman musician. But put them together, and there was history. Let them all break up with each other at the same time, and forget it. After “Rumours,” they continued to create, throughout the ’70s, ’80s and ’90s, music that played large parts on the soundtrack of my life — some forced upon us all as mere members of the planet and some, quite deliberately, chosen by me to illustrate my very own affairs of the heart.Buckingham’s self-torture. Nicks’ self-worship. Christine McVie’s nurturing earthiness. As much as I love Fleetwood Mac’s music, I know that millions of people feel the same way. It’s a powerful connection, and it’s lasted all these years like a bell through the night. Beyond my family’s move in 1977, I remember that early video with the University of Southern California marching band for “Tusk.” Then, a few years later, my love — timeless and sublime (just a wish) — on her parents’ porch in Denver, the wind whipping her hair as she listened to “Mirage.” And, in the early ’90s, a date with someone 10 years younger who had no idea: “Stevie Nicks? Who’s he?” I even wrote an early version of this post for The Atlanta Journal-Constitution a decade ago, when the band released “Say You Will” without Christine McVie, who had retired. Now, 37 years after my family’s long drive, I’m in my Atlanta condo listening to an iTunes playlist of Mac classics. Nicks is everywhere in the media — traditional and social — promoting her new solo CD and the band’s tour, which started this week, its first with Christine McVie since the late ’90s. It stops here in Atlanta in December. They’re all around 70 now. They’ve been together off and on for 40 years. 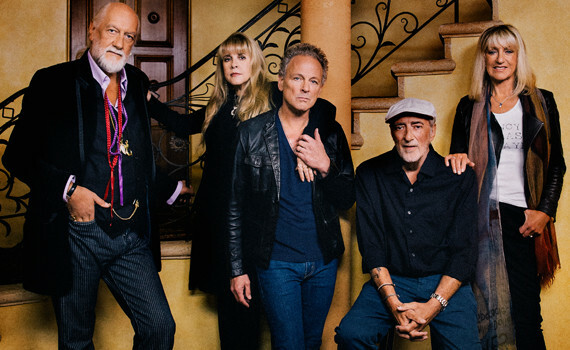 Drummer Fleetwood has come back from his improbable bankruptcy, John McVie from his recent cancer diagnosis, and Christine McVie from early retirement in England. Nicks has survived drug addiction. And Buckingham, the eccentric genius, has found peace with gaudy success. I’m 50 now. It’s been a long time since that summer of “Rumours.” But I still see those bright eyes. And I’m still fallin’, fallin’ . . . fallin’ . . . If you enjoyed this post or anything on storycroft.com, please subscribe at the top of the right column, or by clicking “Follow” in the top left. And ask a friend to do the same. Thanks! Follow me on Twitter @JayCroft! This entry was posted in Atlanta, Entertainment, Social Media and tagged atlanta, concert, Fleetwood Mac, Music, reunion tour, rock, Rumours on October 2, 2014 by Jay Croft. 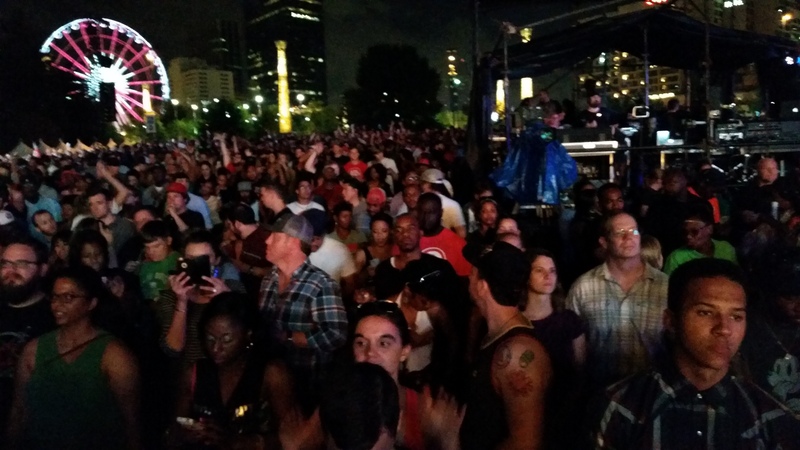 Atlanta loves OutKast, and the superstar hip-hop duo’s three-night stand downtown is proving it. Crowds packed Centennial Olympic Park on Friday and Saturday nights, and more will for the last show tonight, Sunday, Sept. 28. Hometown rappers André “André 3000” Benjamin and Antwan “Big Boi” Patton have been on a reunion tour this summer, the first time fans have had the chance to see them play songs from their landmark CD “Speakerboxxx/The Love Below.” It came out 11 years ago, sold millions and and won the Grammy for Album of the Year. Early crowd before the show. Madkin says, “Favorite moment was the start of the show, with them coming out with ‘Bombs over Baghdad.’ So much energy and excitement from the crowd,” he said. Tonight might be the last show for them. The weekend’s appearances, called “ATLast” after “ATLiens,” one of their earlier records, aren’t even listed on the tour T-shirt. I couldn’t make it, so I asked hip-hop expert and friend Sonia Murray to share some thoughts, which she did after attending Friday and Saturday. She’ll be there again tonight. 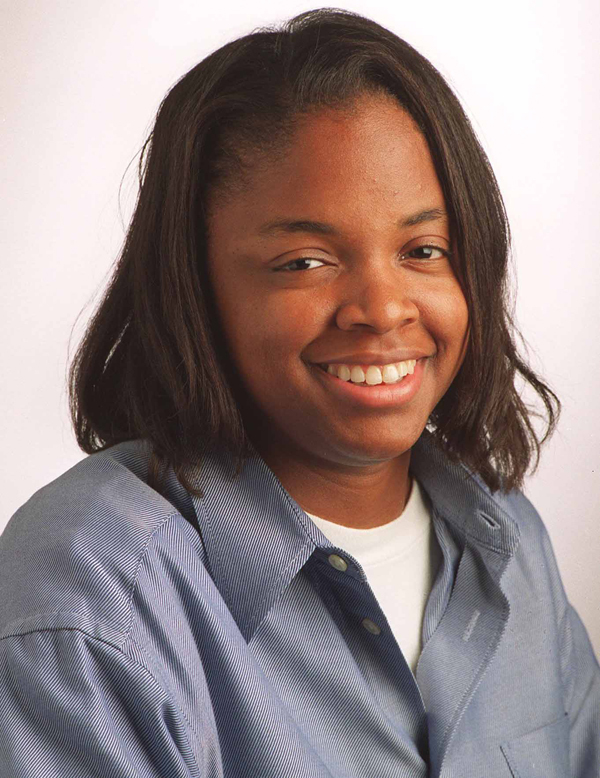 Sonia was a music writer for The Atlanta Journal-Constitution for many years, where she covered Atlanta’s emerging (now dominant) hip-hop scene. She’s now with V-103 The People’s Station. Her Top 3 reasons why this was more than just a concert. 1. It’s probably never going to happen again. “I really do believe that this will be the last time we see them together.” The duo formed when Benjamin and Patton were in high school. They were stars as teen-agers and living legends now in their 30s, with Benjamin looking to movie roles, including Jimi Hendrix. Sonia says that when Outkast was getting started, rap artists didn’t want to associate themselves with Atlanta. The genre was dominated by the East and West coast factions. 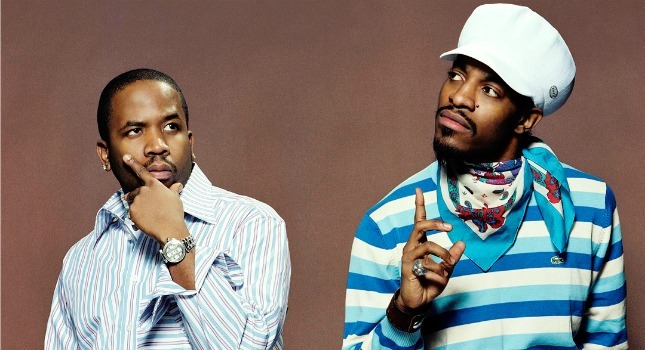 OutKast changed that, with songs calling out local streets, neighborhoods and high schools. 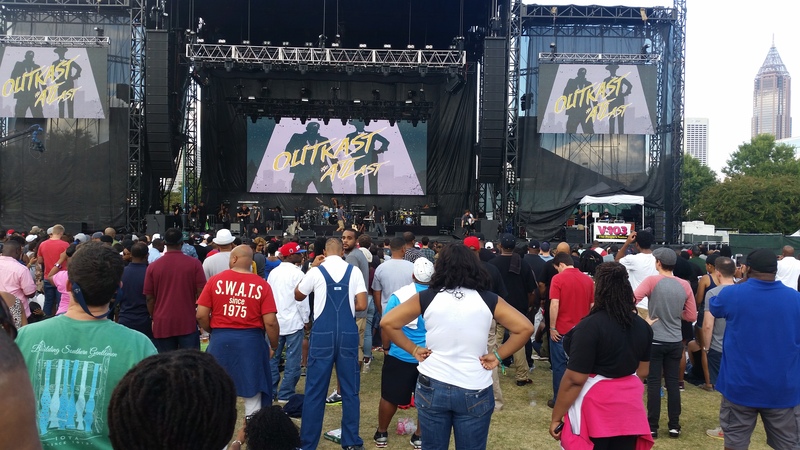 This entry was posted in Atlanta, Entertainment and tagged atlanta, Big Boi, Centennial Olympic Park, downtown, hip hop, Music, OutKast, rap, Sonia Murray on September 28, 2014 by Jay Croft.